"Things to do in Maryland During the Holidays 2014!" The Holiday Season is upon us! Friends and family have begun showing up on our doorsteps; young and hip, those leading a caravan of children, and they all want to have fun! So, here is our list, in no particular order, of "Things to do in Maryland During the Holidays 2014!" Visit Historic Downtown Annapolis, Maryland: Travel + Leisure Magazine gives Annapolis, Maryland the #15 spot on its list of "America’s Best Towns for the Holidays!" This military town along the Chesapeake Bay does plenty of pomp, circumstance, and tailgating during the holiday season. Annapolis ranked well for Christmas lights, notably the drive-through Lights on the Bay in Sandy Point State Park, which starts up in mid-November. Downtown Annapolis also keeps its shops lit and open until midnight on a few Thursdays during December. Don't miss the Eastport Yacht Club's Lights Parade, where every year on the second Saturday in December (12/13/14), magic happens on the water of the Annapolis Harbor—boats suddenly appear out of the cold winter night illuminated with thousands of colored lights and crewed by jolly revelers. Families and friends gather at their favorite viewing spots along the waterfront to see this yearly spectacle and to celebrate the holiday season together. To celebrate alongside the military locals, you can hear Handel’s Messiah performed by the Naval Academy Glee Club in the Naval Academy Chapel, or just sit tight until the Military Bowl, which falls on December 27, 2014, at the U.S. Navy–Marine Corps Memorial Stadium. No surprise, the locals also scored well for being passionate sports fans. Also, for those who want to see Annapolis at night, consider one of Annapolis Tours & Crawls' holiday events like Santa's Naughty Pub Crawl or the Ghosts of Xmas Past Walking Tour! Skating at the Inner Harbor Ice Rink (Baltimore, MD): Located at McKeldin Square – 101 East Pratt Street, Baltimore, MD, 21202 – directly across from Harborplace at Baltimore’s Inner Harbor, the Inner Harbor Ice Rink is open seven days a week, including holidays from November 21st – January 19th! Situated along the Baltimore waterfront, with a breathtaking view of the city's skyline, the Inner Harbor Ice Rink offers family-fun or the perfect setting for a romantic holiday date! And, it's a bargain at only $9 for adults and $7 for children, with a $3 skate rental for those in need! Come on out and get your inner Brian Boitano on! Olde Tyme Christmas in Historic Fells Point! (Baltimore, MD): This year marks the 11th annual Olde Tyme Christmas Celebration in historic Fells Point, where you can enjoy the popular activities and events offered in "Christmas Past" celebrations and also some new events. December 6th, 2014 the neighborhood will be arrayed in fragrant green garlands, red bows, and twinkling lights. What better way to get in the holiday spirit than an authentic Holiday Market, Eggnog Contest, Breakfast with Santa, Horse-drawn Sleigh Rides, Reindeer Run Pub Crawl, Family Holiday Activities, and the Annual Parade of Lighted boats scheduled at 6:00PM. Fell's Point offers a traditional Christmas celebration that will charm and delight you, your family, and friends! For the adults ONLY! Want to go out drinking, carousing and caroling with Old St. Nick? Then take Santa's Naughty Pub Crawl! And while Tours & Crawls Entertainment don't have a direct line to the big guy (besides, he's kinda busy rechecking his list and making sure you're in the right column), you can enjoy a two-hour pub crawl and naughty caroling trip through the streets and pubs of Annapolis, Fells Point or Federal Hill led by their very own Bad Santa or one of his "Naughty" Helpers! Guests are encouraged to dress as the Jolly Fat man himself, as perhaps a naughty Mrs. Claus, the traditional Mrs. for the more inhibited or maybe one of Santa's little helpers on this rip-roaring holiday party crawl! Guest will be visiting numerous taverns, enjoying festive holiday cocktails and seasonal artisan beers all the while singing raucous carols from the "Naughty Xmas Carol Songbook" (to be supplied to each guest). Indulge in Maryland's Holiday Beers! : Tis the season to be drinking...one of Maryland's many fine locally-brewed seasonal craft beers! Here's a short list of beers you should not miss: Heavy Seas Brewing's Winter Storm, Union Craft Brewing's Snow Pants Oatmeal Stout, and then there's the Flying Dog Brewing Holiday Collection, which comes out of a collaboration between the brewery and Baltimore's own Otterbein's Cookies to bring out a line of cookie-flavored seasonal brews, YUM! Eastport Yacht Club Lights Parade (Annapolis, MD): Every year on the second Saturday in December, magic happens on the water of the Annapolis Harbor during the Eastport Yacht Club Lights Parade — boats suddenly appear out of the cold winter night illuminated with thousands of colored lights and crewed by jolly revelers. Families and friends gather at their favorite viewing spots along the waterfront to see this yearly spectacle and to celebrate the holiday season together. The Eastport Yacht Club Lights Parade is one of Annapolis’ signature events and we invite you to join us as a participant in the parade or as a spectator cheering on the decorated boats and their crews. Our tips, get there early to scope out a great viewing spot, bring a blanket (and a flask, wink wink), it can get cold out there! Mayor's Annual Christmas Parade (Baltimore, MD): Mark your calendars! The 41th Annual Mayor's Christmas Parade will be held on December 7th, 2014 at 1PM. Sponsored by community associations and businesses in North Baltimore's Hampden and Medfield neighborhoods. The attendance along the 2.5 mile route reached 25,000 people last year at the Annual Mayor's Christmas Parade to view Santa Claus and about 160 marching units. The parade will feature floats, local TV and Radio personalities, over 100 Harley Davidson motorcycles, a steam calliope, great bands, Mummers of Philadelphia, Miss Yuletide and Jr. Miss Yuletide and of course Santa! Miracle on 34th Street (Baltimore, MD): This is a must see during the holiday season! Check out Christmas Street in the Village of Hampden, located in North Baltimore! Millions of lights on dozens of homes, all along one city block! The lights come on for the season THIS Saturday the 29th between 5:00 and 6:00 PM depending on the TV coverage so they can sync up with there respective networks. Looking forward to seeing everyone there. 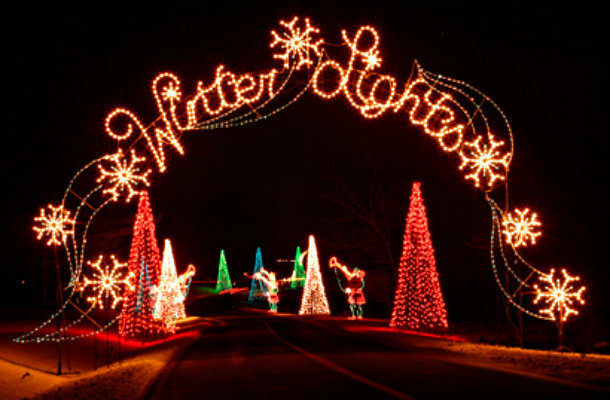 For the season the lights will be on everyday from 5:00PM to 11:00PM. For Xmas eve and New Years eve the lights are on all night. The lights go off for the season on Jan 2nd. Drive-thru Holiday Lights Spectaculars (Sandy Point & Columbia, MD): Pile the family in the car and head on out to check out some really cool holiday lights in these drive-thru light shows! Two of the best are the Lights on the Bay, at Sandy Point State Park near the foot of the Bay Bridge, which benefits Anne Arundel Medical Center, and the Symphony of Lights at Symphony Woods in Columbia, MD, which benefits Howard County General Hospital! "Tours for Toys" Charity Toy Drive (Annapolis & Baltimore, MD): Taking place every December, these events in Annapolis (12/23) and Baltimore (12/12) are a great way to get out and explore these great cities on FREE Walking Tours and Pub Crawls, while providing toys to underprivileged children through a charitable donation. The event's organizers, Tours & Crawls Entertainment and Intrinsic Events are offering up an entire evening of Tours and Crawls at NO CHARGE...all they ask is that guests bring an unwrapped toy which will be donated to two local charities who then distribute them to families in need so that every kid can have a very Merry Xmas! In Annapolis, all toys go to "We Care and Friends" and in Baltimore the recipient is "The Family Tree of MD"! Both great organizations and worthy causes! Come on out and make a difference! Don't forget your toys!